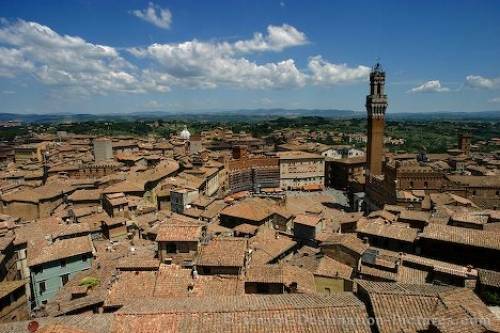 Siena is one of the best known towns in the Tuscany. When you are visiting the Tuscany you have to visit this town. A good idea is to climb the - old and not finished wall outside the dome. From this point you have a outstanding view over the roofs of Siena and the dome itself. Here you can see the Piazza del Campo and the Torre del Mangia where the famous race of Siena is taking place. Picture of the huddled rooftops in the town of Siena, Tuscany, Italy.